by Michael O'Mara Books, Ltd.
Zoella, aka Zoe Sugg, is leading the vlogging revolution with over 7 million followers of her YouTube channel, 2.5 million Twitter and 3.5 million Instagram followers, respectively. 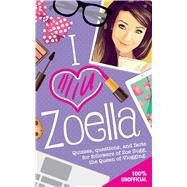 This super new book is a must for any Zoella fan, full of quizzes, puzzles, and games to test your knowledge of your favorite online superstar. Learn everything about Zoella to impress your friends, take a true or false quiz, complete the word searches, and learn how to start your own blog with I Heart Zoella.